Please email me the code of the pen(s) that you would like to purchase, such as "Pen W146" and indicate where you are located so your order can be processed as quickly as possible. Once I have all required order information, I will reply confirming that pen is still available, provide you with a total, including shipping fees, and provide you with payment instructions. All prices listed in this website are in U.S. Dollars. ​All sales are final. No returns allowed. For orders in the U.S., I only accept Square, money orders and checks ​(US banks only; check must clear first). No exceptions. Electronic Payments ... I am now set up to accept payments through Square. With Square you do not need to have an account to send payments. You can pay with your credit card if you are located in the U.S., United Kingdom, Canada, Japan, and Australia. You will still be able to use PayPal if you are located outside of the U.S., but only if those countries are not being serviced by Square. For international orders, payment can be made via Square (United Kingdom, Canada, Japan and Australia only), PayPal and Western Union. No exceptions. Insured shipping via USPS with insurance and tracking number within the U.S. is $10 for the first pen, and $4 extra for each additional pen. Some of my pen offerings (mostly modern pens) come with a pen box and shipping will cost more, depending on weight and dimensions. Express service via USPS is also available at $30 for the first pen (if there is not a pen box) and $12 for each additional pen within the same package. I can also ship your pens via UPS or FedEx. However, be aware their rates are from five to ten times higher than the USPS rates listed above. If you have preferential rates with UPS or FedEx, you are welcome to use your account so I can ship your pens. All you have to do is email me indicating you request I use your UPS or FedEx account and provide me with your account number. ﻿﻿﻿USPS Express International is the recommended shipping option for any fountain I ship internationally. (1) USPS first class international which will come with a reference number. This option is $30 for the first pen and $8 extra for each additional pen. Some of my pen offerings (mostly modern pens) come with a pen box and shipping will cost more, depending on weight and dimensions. The reference number is not necessarily traceable anymore, according to USPS. Unfortunately, the USPS is not even disclosing to which countries they will allow these packages to be traced. In many cases, these package can not even be traced during the US part of the journey. This is the most economical way to ship an international package and you are welcome to use it. However, if you choose this option be aware that you may not be able to trace your package ... and that I am simply shipping your pen with the shipping option of your choosing. I have no control over the USPS or their computerized systems or their customer service department. By using this form of shipment you consent to absorb all risk and liability associated to your package getting delayed, lost, damaged, and not be traceable at all. No exceptions. (2) USPS priority international with a reference number is $48 for the first pen and $8 extra for each additional pen. Some of my pen offerings (mostly modern pens) come with a pen box and shipping will cost more, depending on weight and dimensions. The reference number is not necessarily traceable anymore, according to USPS. Unfortunately, the USPS is not even disclosing to which countries they will allow these packages to be traced. In many cases, these package can not even be traced within the US part of this package's journey. This is the middle of the road shipping option. However, if you choose this method be aware that you may not be able to trace your package ... and that I am simply shipping your pen with the shipping option of your choosing. I have no control over the USPS or their computerized systems or their customer service. By using this form of shipment you consent to absorb all risk and liability associated to your package getting delayed, lost, damaged, and not be traceable at all. No exceptions. 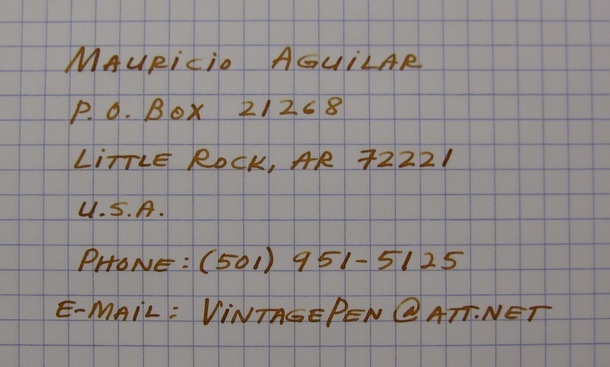 (3) USPS International Express with a tracking number is $65 for the first pen and $18 extra for each additional pen. Some of my pen offerings (mostly modern pens) come with a pen box and shipping will cost more, depending on weight and dimensions. This service normally takes from 3 to 5 business days to reach its final destination and it is the most secured and most traceable shipping option with USPS. USPS Express International is the recommended shipping option for any fountain you want me to ship to you internationally. If you like to have more security and tracing capabilities this is your option. (4) UPS and FedEx: You are also welcome to use UPS or FedEx. Their prices are normally from 5 to 10 times higher than USPS first class international. If you have your own UPS or FedEx account with preferential (discounted) rates you are welcome to use your own account for me to ship your pens to you. If so, pleasure insure you have setup your account to accept to receive collect international shipments originating from the US or these shippers will not allow me to use your account. Should PayPal is used, please insure your mailing address has been updated in PayPal. Otherwise, I will not be responsible if you pen does not reach your new address. If you need to ship your pen to an address different from the one provided by PayPal, you must email me and make special arrangements. Our pens are nicely wrapped in tissue paper, bubble wrap plastic, securely packed inside a cardboard box, and shipped by the Unites States Postal Service with a reference number for the package. A third party entity is being used to insure all packages. ​Copyright © 2009 - 2018 Mauricio Aguilar. All Rights Reserved. Copyright notice: All photographs, written descriptions, flex nib specification, and content appearing in this website are the property of Mauricio Aguilar. They are protected by U.S. copyright laws, and are not to be downloaded or reproduced in any way without the written permission of Mauricio Aguilar. Buying an item does not entitle the buyer to use the photographs, the written description and the flex nib specification information.